These porcini ravioli are a double down on porcini mushrooms: There is porcini powder in the pasta, and the filling is a puree of fresh porcini mushrooms. I make a lot of ravioli and other filled pasta, but this ranks as one of my favorites: It is the earth in a bite. I like my recipe the way it is, but there are a few substitutions you can make. You can skip the farro or whole wheat flour and use all-purpose, and you can use dried porcini mushrooms, too. If you are doing that, rehydrate them in hot water for 30 minutes or so before proceeding with the recipe. You will want about about 1 ounce of dried porcini. 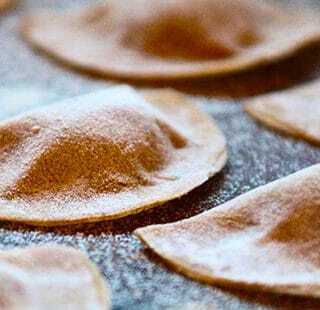 The filling is rich, so make your porcini ravioli on the small side; if you want, you can make them into tortellini. You can of course use other mushrooms here, so feel free to play with it! Make the dough. Mix the two flours, the salt and porcini powder in a large bowl and mix to combine. Make a well in the center of the flour. Beat the eggs and water together and pour into the well in the flour. Mix with a fork until shaggy, then mix with your hands until the dough comes together. Knead on a floured surface for 4 to 6 minutes, or until the dough is elastic, and not sticky. Coat with a thin film of olive oil and wrap in plastic wrap. Set aside for at least 1 hour, and up to a day in the fridge. Make the filling. Brown the porcini in the butter, then add the garlic. Sprinkle some salt over the pan. Saute everything until the garlic turns golden, then pour in the cream and the thyme. Simmer gently until the porcini are soft, about 10 minutes. Toss the thyme sprigs and scrape everything into a blender. Buzz into a puree. Taste for salt again and add some if needed. To make the ravioli, set yourself up a large area to work. Have a little bowl with water in it. Cut off a piece of dough. Cover the rest with the plastic wrap. Roll the dough out until it is very thin, but not all the way to the final setting; I go to No. 7 on my Atlas machine, where No. 9 is the thinnest. Use a wineglass or a circle cutter to cut out circles of dough, and place a 1/2 teaspoon to a teaspoon -- depending on how large your circles are -- just below the center of each circle. Dip your finger into the water bowl and run it along the outside edge of the pasta circle. Fold over the circle to make the ravioli, making sure to press out any air bubbles. Set each ravioli aside on a floured surface as you make them. To cook, boil in salty water for 1 minute after they float to the surface. Toss with the oil, freshly ground black pepper and sage. Spritz with a touch of lemon juice and serve at once. 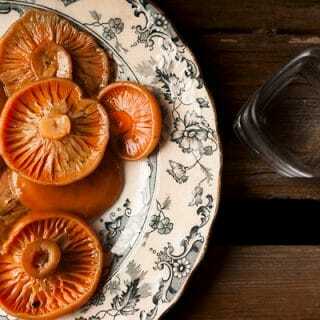 You can find all sorts of recipes for porcini and many other mushrooms here on Hunter Angler Gardener Cook. After I puree the porcini, I add chopped, sauteed in butter porcini that are not pureed, but “pea sized,” to the pureed porcini,so when you bite into the ravioli, you can feel and taste the porcini mushrooms and not just mush.